If you've been thinking about planting a new lawn, now might be a good time to get started. Cold-activated Fescue grass, a popular choice in Southern California, is well suited to the dry, temperate climate and stays green year round. The species spreads its roots rapidly in cooler weather, which makes early spring and late fall ideal for planting. In addition to cool weather, this grass needs quality soil. Unfortunately, the soil in Southern California is often plagued by nutrient-deficiency, drought, and exotic invasives. With a little care, however, those problems are easily corrected. By following these steps, you can transform your soil and create a solid foundation for your new lawn. Soil should be light and airy so the narrow grassroots are able to penetrate it. To improve the consistency, remove any dead plant material then use a garden rake to break apart dense clumps and dig up stones. Avoid standing, walking or pushing a wheelbarrow over the area. This can pack the soil down. Your lawn should slope gently downward, away from the house or building. This will help water spread evenly and allow excess water to wash off the lawn so your grass won’t drown during a heavy rainfall. Ideally, your lawn should drop by approximately two percent -- falling one foot for every 50 feet of distance from the building. The University of California’s Healthy Lawn Guide explains how to measure the gradation. You can correct the slope by redistributing soil as you rake. Sandy soil, common in Southern California, lacks proper nutrients and easily dries out. Even if you’re planting Superior Fescue sod, which can thrive in low-nutrient soil, you should fertilize before you plant. The more nutrition you add now, the less you’ll need to add later. Choose organic composts, or “soil amendments,” such as hay, straw, manure, peat moss, or organic commercial blends. Unlike chemical fertilizer, these nitrogen-rich compounds breakdown over time and gradually release nutrients into the soil. Water is one of the key elements plants need to survive and new grass needs a lot of it. 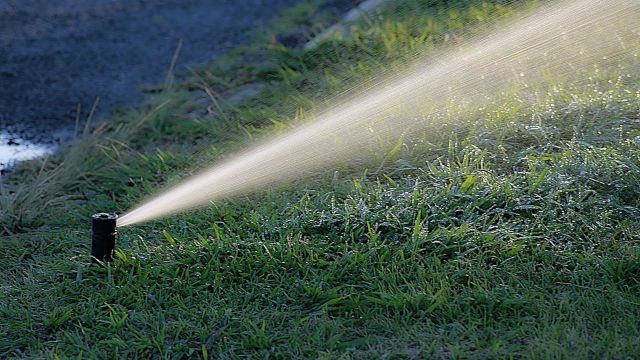 Make sure your soil is well hydrated before you plant by irrigating it once a week for several weeks in a row. This will allow moisture to penetrate the top layer and seep several inches into the soil. Once the roots are established, your grass won’t require as much water. After each irrigation, weeds should begin to germinate. Use a hoe to pull them out by the root before they grow too large. After several cycles, you will have removed much of the potential weed growth. If weeds are abundant or persist, eliminate them with a broad-spectrum herbicide or try solarization by covering the affected area with a plastic tarp for several weeks. While traditional grasses struggle, select varieties thrive in Southern California. Planting a lawn with Superior Fescue sod, for example, requires little preparation and minimal care. The results, however, can be enjoyed for many years. For more information on how to prepare soil, contact us with questions.